I decided to book a trip to Brazil and found myself with an extra 2-days to explore somewhere new. Pondering at some of the obvious choices, it would have been easy to say; lets book Rio, or Sao Paulo, or even an Amazon adventure. The Amazon Rainforest was a tempting choice by default, but then I thought of all of the snakes, bugs, piranhas, critters, and decided to pass. However, after doing a little research, we soon agreed upon our destination. 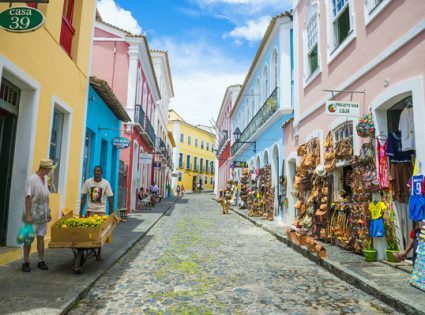 After learning of some of the hidden gems in Brazil, we immediately decided to explore the enriched Brazilian state of Bahia. I came across some incredible pictures, and from there I knew that we would have to explore this breathtaking city of Salvador. We landed in Salvador at the Deputado Luís Eduardo Magalhães International Airport. As soon as we arrived, we began to explore and start checking out the city. The old city of Salvador de Bahia was actually the first capital of the Republic of Brazil – from 1549 to 1763. Bahia was also the first slave market of the New World. The town is enriched with historical landmarks and stories dating back to the 1500’s. Today, the Renaissance architecture has been well preserved. In 1985, the city of Bahia won the UNESCO World Heritage Site Award. Our first stop was in the area known by the locals as Pelourinho and Pelo, the center city during its colonial period. Come to find out, the name Pelourinho actually refers to a whipping post that was used during the cities slave trade day. This post was mainly used for punishing slaves. Quite a bit of depressing history, to say the least. However, the district is much different today in 2018. Pelourinho is a hotspot for all things including bars, shopping, museums, theatres, and some of the cities best restaurants. 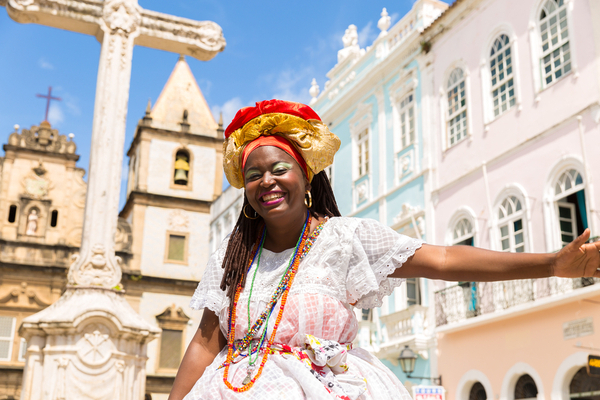 Scattered throughout Pelo’s colorful colonial buildings, there are also street performances that include dancing, musicals, and other plays on a near-daily basis. Unfortunately, we came through on a day that didn’t include any, but Pelo was a fantastic stop and gave some great insight into their culture. We ended up spending a solid half day in the area and had some fantastic local foods and cocktails. My Day Two itinerary included catching a local football match since I knew we wouldn’t be able to come in when the World Cup was in town for obvious monetary reasons and the strong possibility that England won’t be making it out of group play. 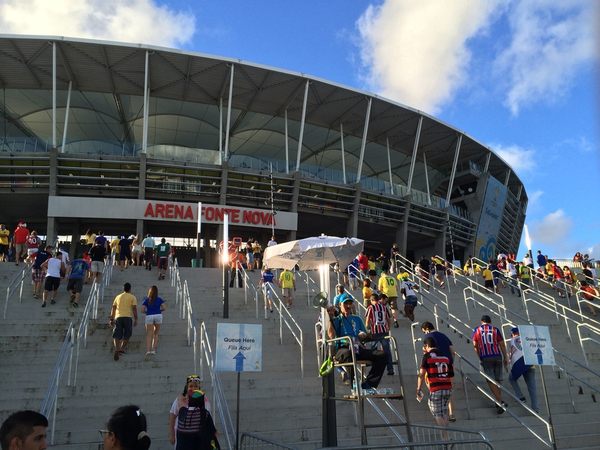 Salvador will host several World Cup matches at the Arena Fonte Nova, including a match between two of the worlds best: Germany and Portugal. The arena is also hosting a Round of 16 matches and a Quarter-Final. However, the most interesting might be the match between Bosnia and Iran, as Bosnia surprised the world with its ability to score. All of that really just explains why I wanted to see a match at Fonte Nova, and I did. It was an incredible experience. The stadium’s 50,000 fans exploded when Biancucchi scored the game-winning goal to put Bahia BA over Botafogo RJ. It is a perfect stadium to host World Cup matches. After the match, we made our way over to the Porta da Barra, which is a beach that faces west in the All Saints Bay. It was great to relax and watch the sunset. It was also the perfect way to close out the day. 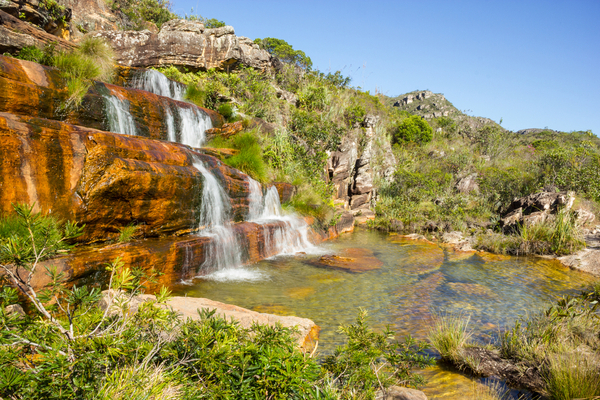 It was time to see the amazing world wonder known as Chapada Diamantina. We left incredibly early in the morning to maximize the amount of time we could spend at the National Park. The six-hour drive to the park was beautiful, especially when we started getting into the hills. I wish we could have spent more time there since there are some amazing tours of the park that take 7-9 days to explore. So how was Chapada Diamantina? It left me speechless. We spent that night in the quaint little city of Itaberaba, had some more great food and drinks. We people watched for hours about the local culture and even caught sight of some locals dancing salsa in the streets. Sadly, the next morning it was time for us to leave. I honestly fell in love with this area of Bahia. Next time I find myself down that way, I would absolutely love to come back and stay a little longer. I highly recommend everyone to consider this region if they are thinking about visiting South America. 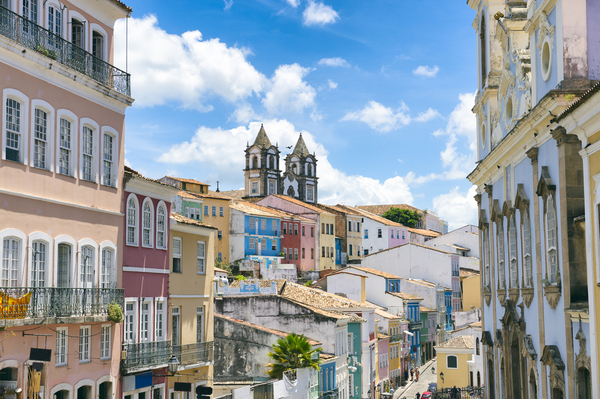 A quick visit to the Brazilian State of Bahia is just what the doctor ordered for a little R&R and exploration.